Monday – busy day. Work followed by visiting the da Vinci exhibition at the Sydney Town Hall meant that it was late when I got home. It was a cold, wet evening and we were hungry so the 5 ingredient 30 minute meal was going to be appreciated. I had some items purchased from the weekly shopping trip in the fridge and pantry as I had planned ahead this week. Whilst I normally like to use fresh ingredients, for these meals using the healthiest prepared foods I could find worked, especially the soup which is the equivalent to nearly 3 serves of vegetables. Add the frozen vegies and there is about 5 or 6 serves of vegies in this meal. Wholemeal bread (for the carbs). 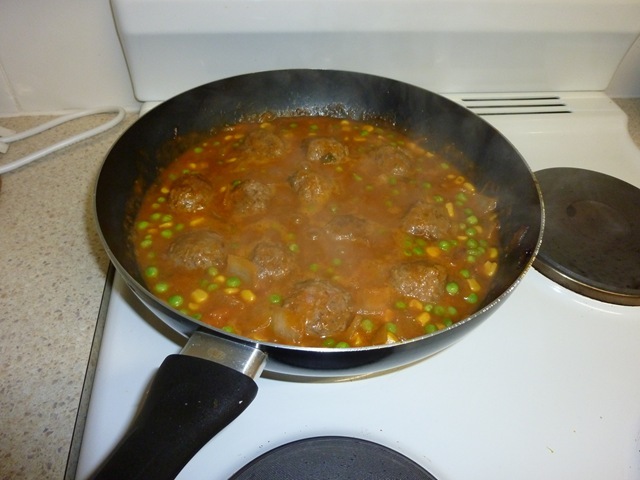 This is a fairly simple meal and uses just the one pot. Take a skillet and start to fry the onion in a little olive oil. As the onion starts to turn translucent add the meatballs to the pan. Brown the meatballs on all sides (this will also have the onions starting to caramelise as well). Add the Velish and the frozen vegetables and bring the heat up and simmer for 15-20 minutes. Serve with the wholemeal bread toasted. The total cost for this meal was around $12 as well and will feed a family of 4. The best thing is that there are vegies in that meal and it is tasty. Second meal target for the week met!